There is absolutely no shortage of talents in the Philippines. Case in point: a Filipina cartoonist making a splash in the world stage. Filipina cartoonist November Garcia makes a splash abroad with her comic books. Born and raised in the Philippines, November Garcia always drew and created comics for fun. But it wasn’t until she moved to San Francisco in her early 20s to attend art school that she discovered indie and underground comics. “Reading Peter Bagge, R. Crumb, and Jim Woodring is what made me want to seriously make comics,” shared Garcia. But despite of the inspiration, she said, she tried to avoid doing any real writing because she wasn’t confident in her abilities. 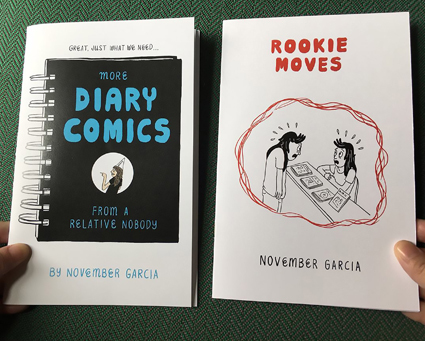 When she returned home to the country in 2015, Garcia continued making comics, persistently and diligently focusing on improving her craft; often just posting her work online to little notice. Then, in a combination of sheer luck and fortuitous timing, Matt Moses of Hic and Hoc Publications, a New Jersey-based publishing house—happened upon her blog and offered to publish her first comic. In 2017, Foggy Notions was released and globally distributed. 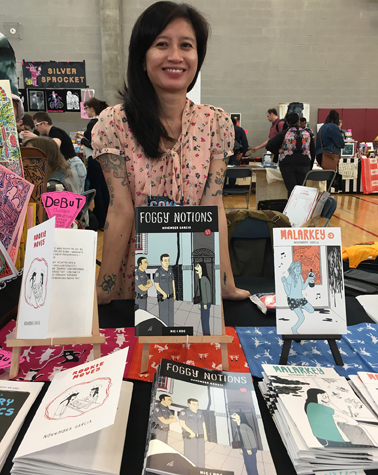 Foggy Notions is a collection of autobiographical shorts that details Garcia’s episodic misadventures during the many years she spent living in San Francisco. It soon garnered critical acclaim around the world. It has also been featured in The Comics Journal, Broken Frontier, High-Low, Just Indie Comics, and more. The Pinay cartoonist’s figure drawing is simple and efficient, but her aesthetic is an homage to her roots in the underground, the indie comics of her predecessors. Garcia’s style is nothing like the ultra-rendered superhero people sometimes associated with the words “comic books,” rather it is based on the influence of Peter Bagge, Gabrielle Bell, John Porcellino, and Lynda Barry. It is the conscious and complete antithesis of flashy superheroes. From the subtleties of real life, alcoholism, and the mundane come moments of great humor and the occasional difficult times. Meanwhile, her serial comic Malarkey—which captures funny events from her daily life, random (mis)adventures, and oddly hilarious conversations with her mother—has also generated its fair share of critical praise. Malarkey #1 was included in The Comics Journal’s list of The Best Short-Form Comics of 2016, while Malarkey #2 was listed in the Top Ten Single Issues of 2017 by the Daily Grindhouse. This year, Garcia is the recipient of Short Run Seattle’s Dash Grant. In addition, she will be premiering Malarkey #3, whose original cover art will be featured at the Fantagraphics Bookstore and Gallery show. Garcia will debut Malarkey #3 in this year’s Short Run Seattle on Nov. 3 and locally at Komikon—the longest running Filipino comics convention—on Nov. 17-18. Her books are distributed locally through distributors and bookstores such as Studio Soup Zine Library, Mt. Cloud Bookstore, Buku Buku Café, and Comics Odyssey. They are also available abroad through the famed Spit and a Half distributor in the US and the Hopeless Sapling Distributor in the UK. Now that she’s back home, Garcia is able to dedicate more time to her comics. Garcia said it’s hard to tell what the future holds, but she promises to make better comics and work a lot harder every day. Find November Garcia at www.novembergarcia.com and on social media at @novembergarcia.